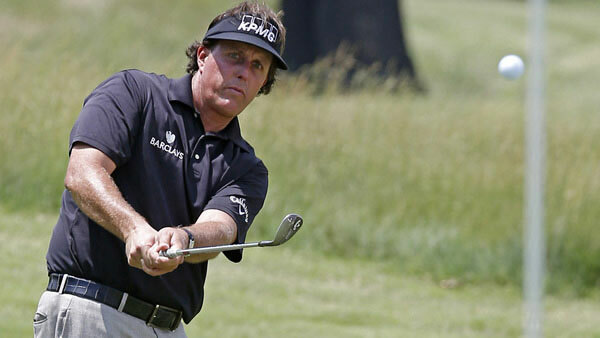 ERIN HILLS, Wis. -- Victory would have made him just the sixth man in golf history to win all four majors, but Phil Mickelson will not be traveling to Erin Hills, Wisconsin, for this year's US Open. Family takes precedence for the five-time major winner, who will instead attend the graduation ceremony of his daughter, Amanda. "As I look back on life, this is a moment I'll always cherish and be glad I was present," he told reporters after the third round of June's Memorial Tournament. Mickelson will be replaced by Mexican world No. 396 Roberto Diaz, a 30-year-old making his tournament debut. It will be the first time the US Open has been contested without Mickelson or 14-time major winner Tiger Woods since 1994. The Pacific Ridge School commencement is scheduled for the morning of June 15 -- clashing with the first round at the United States Golf Association's flagship event. His daughter, class president and a tri-sport varsity athlete, is among the designated speakers. The 46-year-old, who will also celebrate his birthday on June 15, hasn't missed the US Open since his first full year as a professional in 1993. But the American had stressed "there's just really no way to make it," barring a weather delay for the opening round or a late change to the ceremony time. Mike Davis, USGA executive director, praised the player's transparency, adding "appropriate adjustments" would be made. "We certainly understand and support that Phil's family commitments are of paramount importance," said Davis. "We applaud and appreciate the fact that Phil is being proactive." Mickelson, a US Open runner up on six occasions, has made no secret of his desire to win the only major tournament to elude him. But it's not the first time familial and sporting commitments have collided. With his wife Amy heavily pregnant back home in Arizona, Mickelson wore a pager during the 1999 US Open at Pinehurst and was ready and waiting to walk off the course at any moment should she have gone into labor. As it happened, Mickelson ended up contesting for the trophy, culminating in a final-round duel with the late Payne Stewart. Though Mickelson, known as Lefty, would go on to finish second, falling short by a single shot, Stewart famously consoled him, cupping Mickelson's face in his hands and saying "Good luck with the baby. There's nothing like being a father." That baby, born just a day later, is now graduating college.